Toshio represents a striking trend in Japanese crime. In a remarkably law-abiding society, a rapidly growing proportion of crimes is carried about by over-65s. In 1997 this age group accounted for about one in 20 convictions but 20 years later the figure had grown to more than one in five - a rate that far outstrips the growth of the over-65s as a proportion of the population (though they now make up more than a quarter of the total). "I couldn't get along with my husband. I had nowhere to live and no place to stay. So it became my only choice: to steal," she says. "Even women in their 80s who can't properly walk are committing crime. It's because they can't find food, money." We spoke some months ago in an ex-offender's hostel. I've been told she's since been re-arrested, and is now serving another jail-term for shoplifting. Michael Newman, an Australian-born demographer with the Tokyo-based research house, Custom Products Research Group points out that the "measly" basic state pension in Japan is very hard to live on. In a paper published in 2016 he calculates that the costs of rent, food and healthcare alone will leave recipients in debt if they have no other income - and that's before they've paid for heating or clothes. In the past it was traditional for children to look after their parents, but in the provinces a lack of economic opportunities has led many younger people to move away, leaving their parents to fend for themselves. "The pensioners don't want to be a burden to their children, and feel that if they can't survive on the state pension then pretty much the only way not to be a burden is to shuffle themselves away into prison," he says. The repeat offending is a way "to get back into prison" where there are three square meals a day and no bills, he says. "It's almost as though you're rolled out, so you roll yourself back in." Newman points out that suicide is also becoming more common among the elderly - another way for them to fulfil what he they may regard as "their duty to bow out"
The director of "With Hiroshima", the rehabilitation centre where I met Toshio Takata, also thinks changes in Japanese families have contributed to the elderly crime wave, but he emphasises the psychological consequences not the financial ones. "Ultimately the relationship among people has changed. People have become more isolated. They don't find a place to be in this society. They cannot put up with their loneliness," says Kanichi Yamada, an 85-year-old who as a child was pulled out of the rubble of his home when the atomic bomb was dropped on Hiroshima. "Among the elderly who commit crimes a number have this turning point in their middle life. There is some trigger. They lose a wife or children and they just can't cope with that... Usually people don't commit crime if they have people to look after them and provide them with support." Toshio's story about being driven to crime as a result of poverty is just an "excuse", Kanichi Yamada suggests. The core of the problem is his loneliness. And one factor that may have prompted him to reoffend, he speculates, was the promise of company in jail. It's true that Toshio is alone in the world. His parents are dead, and he has lost contact with two older brothers, who don't answer his calls. He has also lost contact with his two ex-wives, both of whom he divorced, and his three children. I ask him if he thinks things would have turned out differently if he'd had a wife and family. He says they would. "If they had been around to support me I wouldn't have done this," he says. 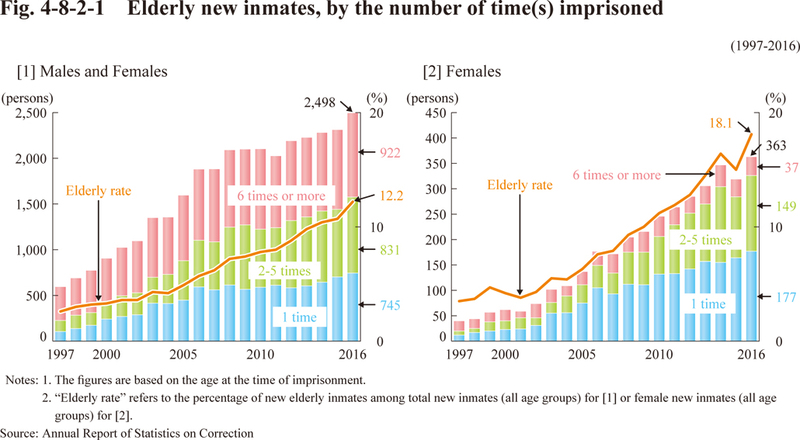 Michael Newman has watched as the Japanese government has expanded prison capacity, and recruited additional female prison guards (the number of elderly women criminals is rising particularly fast, though from a low base). He's also noted the steeply rising bill for medical treatment of people in prison. There's a lot of marching inside Japanese prisons - marching and shouting. But here the military drill seems to be getting harder to enforce. I see a couple of grey-haired inmates at the back of one platoon struggling to keep up. One is on crutches. "We have had to improve the facilities here," Masatsugu Yazawa, the prison's head of education tells me. "We've put in handrails, special toilets. There are classes for older offenders." "We sing to show them that the real life is outside prison, and that happiness is there," Yazawa says. "But still they think the life in prison is better and many come back." Michael Newman argues that it would be far better - and much cheaper - to look after the elderly without the expense of court proceedings and incarceration. "We actually costed a model to build an industrial complex retirement village where people would forfeit half their pension but get free food, free board and healthcare and so on, and get to play karaoke or gate-ball with the other residents and have a relative amount of freedom. It would cost way less than what the government's spending at the moment," he says. But he also suggests that the tendency for Japanese courts to hand down custodial sentences for petty theft "is slightly bizarre, in terms of the punishment actually fitting the crime". "The theft of a 200-yen (£1.40) sandwich could lead to an 8.4m-yen (£580,000) tax bill to provide for a two-year sentence," he writes in his 2016 report. That may be a hypothetical example, but I met one elderly jailbird whose experience was almost identical. He'd been given a two-year jail term for only his second offence: stealing a bottle of peppers worth £2.50. "Even if they only stole one piece of bread," says Masayuki Sho of Japan's Prison Service, "it was decided at trial that it is appropriate for them to go to prison, therefore we need to teach them the way: how to live in society without committing crime." I don't know whether the prison service has taught Toshio Takata this lesson, but when I ask him if he is already planning his next crime, he denies it. "No, actually this is it," he says. "I don't want to do this again, and I will soon be 70 and I will be old and frail the next time. I won't do that again." On that point, they've obviously failed if the people increasingly see it as an easy way to live cheaply/free for awhile. I call it the prison retirement program. Coming to America soon and brought to you by those who live for the day -- a.k.a. r selective types. When I worked as a correctional officer in the county jail, we would have a greater incidence of parole violations during cold weather. The perpetually institutionalized know where to get three hots and a cot. The Japanese figured it out. Funny, while watching the Lockpicking Lawyer pick a (crappy) Japanese bike lock he mentioned that people in Japan generally don't lock up their bikes due to the low incidence of petty crime. It seems even those that are committing crime "don't even mean it". Crazy. There's a population implosion, not enough workers to take care of the elders, and the elders are living into their 100's. There are two pension systems in Japan. If you were a 'salaryman' you and your employer paid in significantly and you are set. If you were self-employed, you paid very little and will get a pittance. I just read the other day where you said you live in Tokyo I believe? How is crime there from your perspective? I am back and forth between Japan and US. Crime? What crime? Walk just about anywhere in Tokyo just about any time day or night and you are safe, even stumbling drunk. Drop your wallet on the street, you are quite likely to be able to pick it up at the Police Box a couple hours later because a thoughtful citizen has turned it in. The homicide rate is 0.28 per 100,000. Only tiny places like Lichtenstein have lower murder rates. Compare that to US rate of 5.35 per 100,000.... US has the highest murder rate in the OECD, ranking 143rd in the world, comparable to shitholes in africa and elsewhere. What about ex presidents, SOS's, and politicians? I would have thought they would have exempted themselves from the same rules as the slave class. IDK, We've never had one in prison..........yet! Individual 1 might test the theory soon. but Japanese courts treat petty theft seriously, so it was enough to get him a one-year sentence.